One Single Life iOS Game Lets You Play Just Once – Attempts To Make You Truly Care About Your Character | OhGizmo! Seeing a video game character die on-screen is only upsetting because it usually means you have to restart a level. There’s really no emotional connection to them besides frustration. But what if your character dying was truly the end of the game? Like forever? No continues, no extra lives, no way to try again. Would you start caring a bit more about them then? That’s the question a game called One Single Life for iOS devices might make you ponder. As you can see in the gameplay footage below it’s another one of those ‘perfectly time your jump to make it to the next building’ games, but in this instance if you don’t, that’s the end. No more chances or do-overs. There is a Jump Simulator mode that lets you practice a level as many times as you want, but when it’s time to do it for real it’s literally do or die. If you fail, the game will never let you play again. 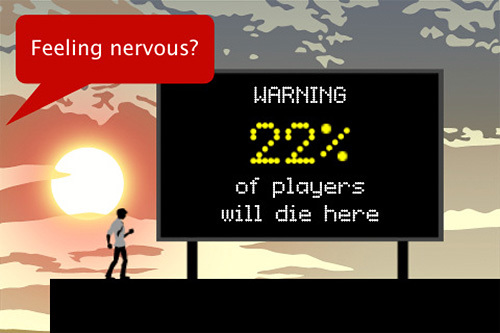 Throughout the game you’re also taunted with statistics about how many players die on a particular level, which adds to the stress level. And because there’s a chance you may never actually make it past the first level, it’s available for free. I like the idea of having only one life in games. It makes you think more responsibly. Although it doesn't let you be curious about stuff. 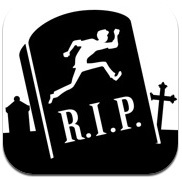 Hmm..I have an idea, if you died in game, can you reinstall it to have another life in playing? We can find ways too you know. Reminds me of the “New Cap City” game in Caprica. Of course, that it realistic VR, but you know what I mean. Good idea…I hope it comes to Android. These kinds of games seriously annoy me, because I just view them as a challenge to solve the problem “how can I trick the game into thinking I haven’t played it before?” With flash game versions of these things, you can erase the data it saved to your computer to retry, and then the game loses all meaning. I like the title of the game. so make it worth living.